Today many business users are spending increasing amounts of time trying to find and integrate the relevant pieces of data needed to perform specific tasks and produce insights. One reason for this is that data has become distributed across many different data stores, making it difficult to access integrated, relevant data for cross-functional use. Data virtualization technology has emerged to simplify data access. 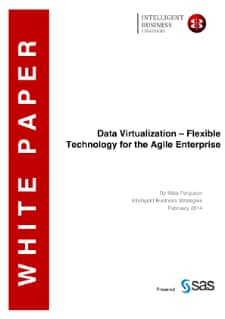 As this paper by Mike Ferguson of Intelligent Business Strategies explains, data virtualization software gives the impression that data is integrated and stored in a database even though it is not. Using virtualization software, it is possible to create multiple virtual views of data and present data as if it is integrated. Read this paper to learn how virtualization works and how it can impact your organization, find out the requirements for using the technology and see how SAS delivers products that can help you incorporate virtualization into your technology mix.